So I had this plan to review this book last week while Storey was posting all sorts of delicious recipes on their Facebook page (Storey posts lots of recipes, tips and occasional giveaways). Time got away from me while working on the coloring book and to do it justice, it needs reading. I planned to review this after trying a few recipes. Then it became clear that it was going to take a bit longer. 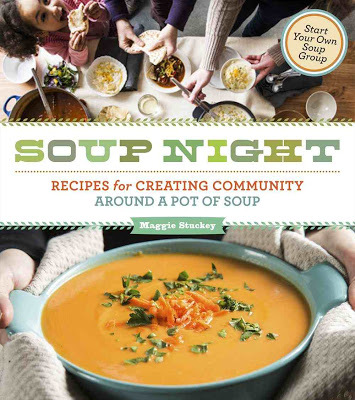 The reason is that this book is a big part of this book is stories about how hosting a soup night can build a community and those stories need reading. They are warm, touching and inspiring. Being busy, reading those stories was a happy break. It's all about making a couple pots of soup- one vegetarian and one with meat and inviting the neighbors over on a regular basis or alternating hosting so that you have a soup night once a month. A time to catch up with the neighbors, form friendships and creating a true neighborhood. It reminded me a lot of when I was younger and always had a pot of soup on and people would just drop by for soup, coffee and company. The recipes- I love making soup. It's one of my favorite things because soup is easy, it's warm and comforting on a cold winter night. The recipes aren't just for soup- there are some for breads to go with the soups, salads, desserts and other things to serve on a soup night. The soup recipes are fantastic and varied which is one of the best things about a cookbook that has lots of contributors. Creamy soups, cold fruit soups, hot minestrones, bean soups, and a bit of something for everyone. Great recipes from the people and groups mentioned in the book, with gorgeous photography. Not every recipe is photographed, but a lot of them are. Printed in full color, with a good index, this is one of my favorite cookbooks of the year. The recipes are clear and well written. There is a great tips section full of ideas for stocking your pantry to make soup on the fly, the pros and cons of dried vs canned beans and lots of other ideas. I highly recommend this, both to read and as a cookbook. Amazon affiliate links help pay for this site and my book addiction.